The mountain sacred to the Indians was depicted by the artist many times. While on an expedition to Tibet, he could not resist her charm, each time opening a new viewing angle to Kanchenjungu. Simple colors create an atmosphere of calm, making it clear to the viewer that the picture is morning. The mountains only wake up, looming from the haze and fog. But contrary to expectations, Roerich depicted mountain ranges in the foreground, not belima, but blue. The foreground is represented in purple and blue. Both are saturated but not bright. But Kanchendzhang itself is located in the background. It attracts with its snow white. And in order not to distract the audience’s attention from her, the mountain range, located in front of the mountain, is completely obscured. It seems that the fog has not had time to leave the mountains, as evidenced by the white haze that separates the picture into the foreground and background. Translated from Hindi, the name of the mountain means “five treasuries of big snow”. 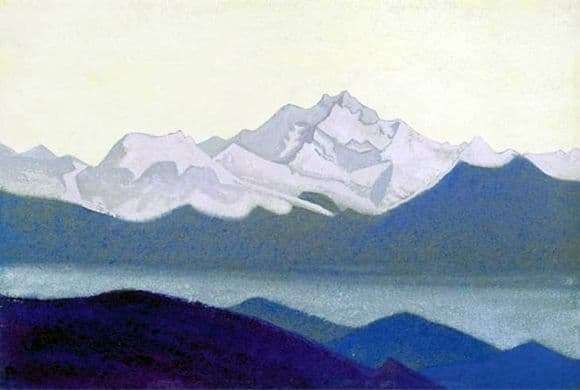 The greatness of the name inspired Roerich to display it on the canvas: the pristine and pristine Kanchenjunga rises above the world. But she does not suppress her power or greatness, but brings peace and harmony with her presence here. The morning light, playing on the snowy slopes of the mountain, conveys the greatness of all the Himalayas, exalting it to cosmic dimensions. Humanity seems worthless against the backdrop of stone-snow massifs, but the whole world feels immense. It is full of contradictions and so little ideal, but in this lies its beauty. Similarly, soft curls of mist that swirls in the gorges, and crisp, even slightly sharp, forms of mountains and ridges are harmoniously combined. Only Roerich such contrasts are able to create a sense of harmony of the world. So the viewer can be made to understand and experience what he saw by the artist: the mountains are full of mystery and divinity, but they are completely real.